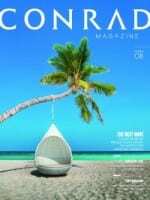 Destination meets design as Conrad Fort Lauderdale Beach opens on the Gold Coast. the late, great architect Michael Graves has left an indelible mark on Fort Lauderdale’s exclusive North Beach in the shape of Conrad Hotels & Resorts’ second Florida property. . The 290 all-suite oceanfront resort, which opened its doors in October 2017, is a fine example of Graves’ postmodern vision and mirrors the transcendent nature of Fort Lauderdale, dubbed the yachting capital of the world. Inspired by the golden era of high-end cruise liners, this Gold Coast property evokes the breezy lifestyle of pleasure voyages. Porthole windows climb the Conrad Fort Lauderdale Beach’s distinctive facade, perfectly framing ocean views for the resort’s suites, which were designed to recall the sinuous curves and sleek dimensions of a yacht. Indeed, most of the property’s walls do not come to a 90-degree angle, rather a slight curve, helping guests to feel as if they are on a cruise ship. The nautical thread is weaved into the whole property, from the circular lobby to the third-floor meeting rooms named after winds, including Sirocco from the Sahara; Etesian, a dominant weather influencer in the Aegean Basin; and Coromuel, a land breeze from the south in La Paz, Mexico. Conrad Fort Lauderdale Beach also houses four food and beverage outlets, including the Atlas Cocktail Lounge, which provides a diverse menu of globally-inspired lite bites including Charred Octopus and Caviar Cones. And what to do if you do not want to tear yourself away from your temporary abode? 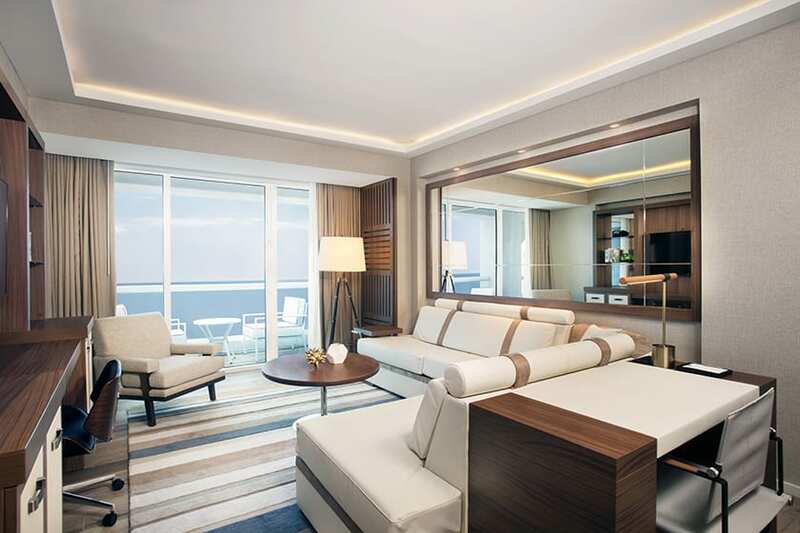 Each of the 290 suites are available for sale, so you do not have to skip on enjoying the sea breezes of the Intracoastal Waterways and views of the cerulean Atlantic Ocean.